Save a significant amount of money by paying a lot lower import tax (in some cases almost 0%) depending on the country you import to. Our logistics team will provide you with all necessary paperwork about Thailand’s Free Trade Agreement such as GSP, FTA. We believe in building long lasting trustful business relationships with our partners.That is why we handle all of our orders to the same standard as a major retailer would, no matter the volume of your order.Small or Big, you are getting our full experience and attention. All of our clients have the option to choose an alternative metal for their OEM jewelry products. As a client, you can choose between Silver, Brass, Bronze, and Gold-Plated metal. Have your questions answered in less than 24 hours via email. Additionally, our team can call you anywhere in the world and discuss your requirements. Royi Sal Jewelry customer success team members are all well-trained in professional English discussions. With more than 17 years of experience as one of the top silver, gemstone, crystal and gold-plated jewelry manufacturer in Thailand. We can guarantee your satisfaction. Our team focuses on building long-term relationships with business partners who choose us as their jewelry manufacturer in Thailand. Due to this fact, we maintain continuous business partnerships for more than ten years with several of our customers. We are eager to get to know you and your business requirements. 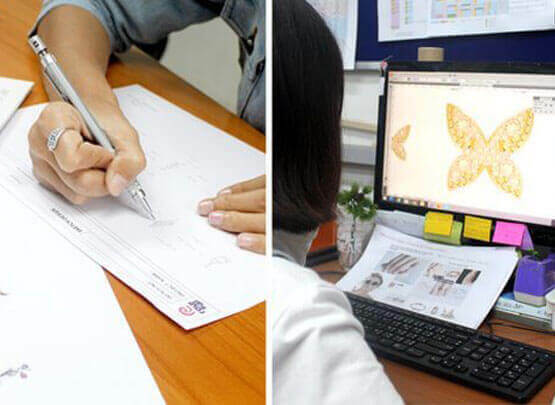 Moreover, explore how we can assist you with your jewelry manufacturing needs.